In many countries, whether driven by political or media pressure for tighter security, a punitive approach to imprisonment, inadequate staff-prisoner ratios or a lack of training on inter-personal skills, de-escalation and mediation, prison management often takes unnecessary or disproportionate recourse to security measures in violation of detainees’ right to dignity. identify situations where there is a particular risk that security is overemphasised to the detriment of the dignity of prisoners. These include: over-classification of prisoners, body searches, instruments of restraint, solitary confinement, and staff-prisoner relations. 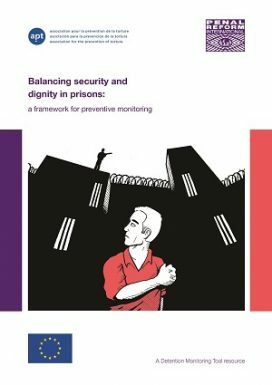 This paper is part of PRI/APT’s Detention Monitoring Tool, which aims to provide analysis and practical guidance to help monitoring bodies, including National Preventive Mechanisms, to fulfil their preventive mandate as effectively as possible when visiting police facilities or prisons. The tool seeks to support such bodies in addressing systemic risk factors that contribute to an environment where torture or other ill-treatment occurs.